Moulin Rouge - French for "Red Mill"- is a cabaret in Paris, France.The original house, which burned down in 1915, was co-founded in 1889 by Charles Zidler and Joseph Oller.Moulin Rouge is best known as the spiritual birthplace of the modern form of the can-can dance.Today, the Moulin Rouge is a tourist attraction, offering musical dance entertainment for visitors from around the world. 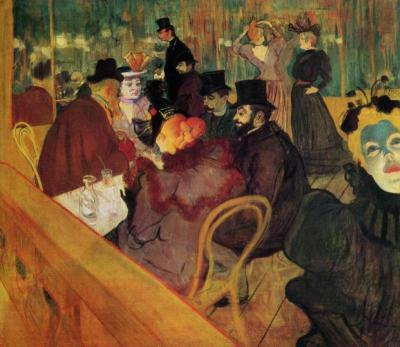 The club’s decor still contains much of the romance of fin de siècle France. Moulin Rouge! is also a 2001 Australian–American musical film directed, produced, and co-written by Baz Luhrmann. It tells the story of a young Scottish poet/writer, Christian (Ewan McGregor), who falls in love with the terminally-ill star of the Moulin Rouge, cabaret actress and courtesan Satine (Nicole Kidman). It uses the musical setting of the Montmartre Quarter of Paris, France. Click HERE and answer the questions in the quiz. How much do you know about the Elephant Love Medley in the film Moulin Rouge? Click HERE to go to the Moulin Rouge by IES Taboada Chivite students.